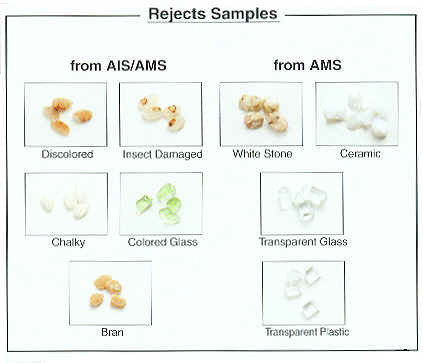 Each individual grain is precisely distinguished by using digital image processing to remove the rejects. As a result, fewer good grains are lost to the rejects. The sorting accuracy has been significantly improved by the use of CCD sensors, which have five times higher resolution capabilities than conventional ones. Small defects can be sensed and rejected with much higher accuracy. The resolution of the CCD Camera is 0.14mm - enabling outstanding sorting performance. Because of its computerised control system, the RMGS series can be applied to any kind of rice. Thus, it is capable of simultaneous sorting of chalky rice and discoloured rice, as well as transparent and white resin and glass. The shorter distance between the ejector nozzle and grain to be ejected reduces compressed air consumption by two-thirds than conventional models. The ejectors are spaced every 3.3mm to accurately target and remove defects. - Status indications used throughout system for simple trouble shooting plus diagnostic display, maintenance log and run time statistics provide the tools to increase production effectiveness and reduce downtime.